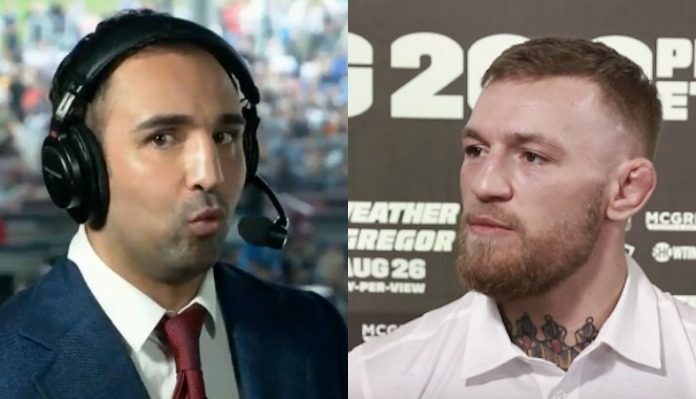 Conor McGregor was not happy when he caught wind that his former sparring partner Paulie Malignaggi had slapped his longtime friend Artem Lobov. The incident occurred at Tuesday’s Bare Knuckle Fighting Championships media day scrum. After a verbal altercation, things got physical when Paulie decided to slap the “Russian Hammer” across the face. The two BKFC combatants were forced to be separated. This evening, Conor McGregor took to Twitter where he posted a plethora of photos showcasing him seemingly getting the better of Paulie Malignaggi from their infamous sparring session in the summer of 2017. The Irish superstar had brought in “The Magic Man” as a sparring partner in the lead up to his fight with boxing legend Floyd Mayweather. Check out the photos Conor McGregor posted in response to Paulie Malignaggi’s antics below. Artem Lobov will be making his BKFC debut later this month against fellow former UFC veteran Jason Knight. As for Conor McGregor, the former two-division UFC champion recently announced his retirement from the sport of mixed martial arts. With that said, many fans and analysts believe that McGregor’s second career retirement is simply a ploy to gain strength in negotiations with the UFC. The brash Irish star did not stop with Paulie. After unveiling his photo album from the Malignaggi sparring session, McGregor took aim at Khabib Nurmagomedov, and the Russians wife, in some controversial posts which were later deleted from social media. What do you think will be next for former UFC champion Conor McGregor? Sound off in the comments section PENN Nation!